Trailhead and parking area are on Kancamagus Highway in Albany, NH (summit is in Waterville Valley). The parking area is on the south side of the road, 21.0 miles east of Rt. 93 at exit 32 in Lincoln and 14.2 miles west of Rt. 16 in Conway. It is signed for Downes Brook, UNH, and Mt. Potash Trails. 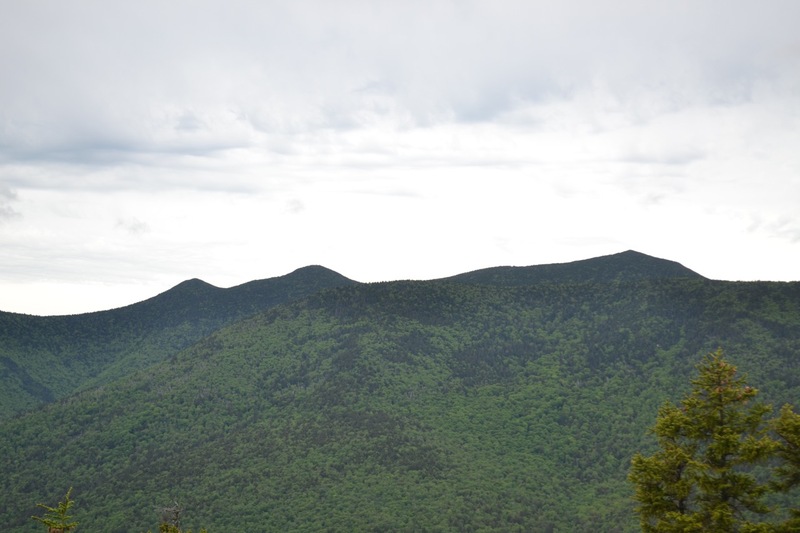 Although several roads in the White Mountains rise to a higher elevation than the summit of this insignificant mountain and that of its neighbor, Hedgehog Mountain (the hike to Hedgehog begins at the same parking area), Potash Mountain commands views greater than many higher peaks. The hike is short, but steep, and hikers are rewarded with open ledge walking near the summit. It begins on the Downes Brook Trail, which follows a cross-country ski trail in the beginning. Pass the UNH Trail to Hedgehog Mountain and climb a rocky slope, then turn right to stay on the trail. The trail traverses through short conifers, then enters the forest and soon reaches Downes Brook. At 0.3 miles, turn right onto Mt. Potash Trail and make a difficult crossing of Downes Brook, with insecure footing. On the other side, the trail climbs away from the brook, and in 0.2 miles, crosses a dirt road. A stone staircase leads back into the woods, where it continues angling across the slope. Eventually, it turns to the left and begins switchbacks, climbing over rock slabs and roots. After several switchbacks, the trail emerges on a ledge with a great view into the Sandwich Range Wilderness toward Mt. Passaconaway and Hedgehog Mountain. The climb pauses for a short distance, then continues over rockier terrain. Near the summit, the trail goes out onto steep open ledges, where views toward the Tripyramids appear. The summit, reached at 2.2 miles from the parking area, is marked with a painted X and an orange post. The north-facing ledge at the summit provides a fantastic vista of the Mountains around the Kancamagus Highway. To the south and west are the higher mountains of the Sandwich Range, Mts. Passaconaway and Whiteface, the rolling Sleepers, the sharp Tripyramids, and the camouflaged Fool Killer. The cliffs of Mt. Osceola are seen over a ridge to the west. In front of you is the great valley around the Kancamagus Highway. Kancamagus Pass, the highest point on that road, is seen to the northwest, between Mts. Kancamagus and Huntington. To the north are Mts. Hancock and Carrigain, with the cliffs of The Captain between them. To the right of Mt. Carrigain is the nearer Greens Cliff, which blocks most of Carrigain Notch from view. To the right of that is the Nancy Range. By moving further down the ledge, you can also see Mt. Washington.